The Royal Tokaji Wine Company was established in 1989 in the village of Mád in the Tokaji region and is a joint venture 63 local growers led by Istvan Szepsy, who was a descendant of the legendary Mate Szepsy, and foreign investors, among those, the celebrated wine author Hugh Johnson. Hugh has put all his effort into preserving the unique values of the Tokaji region to create high quality Aszú wines and pioneered the production of Single Vineyard wines. 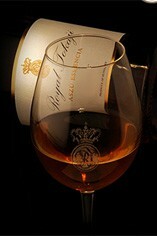 Today, The Royal Tokaji Company has become one of the most famous wineries in Tokaji. Fine Tokaji wines became almost extinct when Hungary fell under Communist rule after the 1939-1945 war when quantity replaced quality. Their renaissance was triggered by the crumbling of Communism and the founding of The Royal Tokaji Wine Company in 1989, a joint-venture between local wine growers in the village of Mád and an inspired group of international investors. The mission of The Royal Tokaji Wine Company was to restore quality and to make the finest wines of 5 “puttonyos” or more, so that once again Tokaji Aszu wines could be described in the hedonistic words of Louis XIV as, “The king of wine, and wine of kings”. During 2009, on the eve of their 20th anniversary, the Royal Tokaji winery has undergone a metamorphosis which combines the best of tradition with the best of 21st century technology. By contrast, in their vineyards and cellars the age old traditions of making Tokaji wines remain unchanged. The rotten, raisin-like Aszú berries are selected and picked one by one from bunches of grapes hanging on the vines in late autumn into wooden tubs known as “puttonyos”. A “puttonyo” holds 20 kilos of Aszú grapes and is used as the standard measure of the final sweetness in Tokaji wines. The wines are created in a unique two-stage process which gives them their magical combination of luscious richness and sensual acidity. The intensely sweet juice gradually oozes from piles of Aszú berries and is added to small oak “gonci” casks filled with base wine of the previous year. This mixture is repeatedly stirred for two or more days to extract the maximum flavour and sugar from the Aszú paste and then left to ferment gently in Royal Tokaji’s deep, dark, damp underground cellars, a transformation which may take one or two years. 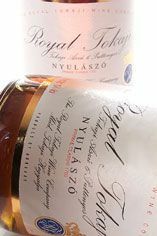 Legally Tokaji Aszú wines must be aged for a minimum of three years, but Royal Tokaji prefer to set their own higher standards. Essencia wines are made from the viscous honey-like Aszú juice only, and are fermented in the underground cellars in glass jars, a transformation which can take more than six years due to a combination of the extremely cold atmosphere and intensely high sugar level in the grape juice. 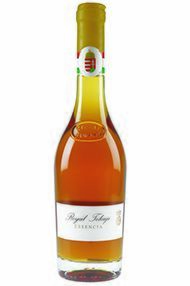 The Royal Tokaji range includes dry white Furmint, late harvest Ats Cuvee, 5 and 6 puttonyos Aszu blends and single vineyard wines, Aszu Essencia and very limited quantities of Essencia wines. The Essencia instantly appeals when you pour it with its gloriously thick texture in the glass. The colour is bright amber laced with 511 grams of residual sugar which is visible in the wine, like an incredible pane of stained glass. The nose is incredibly complex and expressive with scents of honey, peach, freesia, blossom and citrus peel. With each swirl of the glass more layers reveal themselves, now apricot and orange with an energetic viscosity in the mouth. The length is one of the longest finishes on a wine I believe I have tasted and it is more detailed than I could have ever imagined. Simply glorious. According to Chris Donaldson MW, at 2.2% ABV, the Essencia is ‘good for babies and good for breakfast. 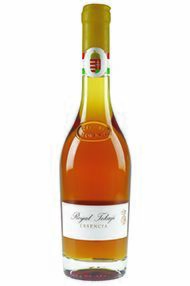 Essencia is the richest and rarest of all Hungarian Tokaji wines. It is the truest expression of terroir known to man. Typically, this free run juice takes 6 to 8 years to complete its fermentation to less than 2% alcohol. Essencia can reach 85% residual sugar. Essencia wine is legendary. 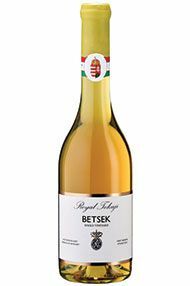 This Tokaji wine displays a rich, fat mouthfeel of honey, apricots and marmalade with uplifting acidity to balance out the sweetness. An ideal partner to foie gras. The 2008 vintage provided excellent conditions for noble rot to develop, and the Betsek vineyard has created beautifully elegant and balanced wines in this year. The citrus acidity perfectly counterpoints the ripe apricot and pineapple sweetness of the wine. Delicious! Mezes Maly, in the Tarcal commune of Hungary, has the distinction of being one of two vineyards to be elevated to the equivalent of Great 1st growth in the Rakoczi classification of 1700. Situated on loess soil on a south facing slope, this famous vineyard is now enjoying a renaissance of its own. Mezes Maly’s characteristics evoke its translation as ‘honey pot'. Its incredibly long and exquisitely balanced aromas and flavours combine the very essence of aszu wines. 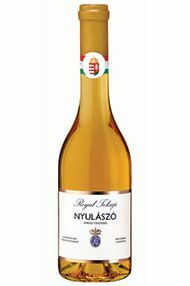 Mezes Maly's 11 hectares are jointly owned by the Royal Tokaji Company and Hugh Johnson. Tokaji is probably my favourite wine, and this is one for the serious wine lover in your life. Each sip feels like coming home – sweet, peachy, richly complex and luscious, with a spark of life-enhancing spice. An absolute gem. The 18 hectares Nyúlászó (nu-laah-sooh) vineyard is one of the most well-known vineyards in Tokaji, and the first that the Royal Tokaji Wine Company purchased. This First Growth single vineyard vineyard is located on south-, southwest- and southeast-facing slopes overlooking the village of Mád and contiguous with the St Tamas vineyard. The grapes grown here produce lively, elegant and highly-perfumed wines, characteristics typically associated with wines originating from grapes grown in loess soil, whereas the Nyulászó vineyard is predominantly red volcanic clay with only pockets of loess soil present. Because of this unusual soil composition, the wines that are made from Nyulászó’s grapes are the most complex wines in the Royal Tokaji portfolio. the 2003 vintage displays medium amber colour with a rich deep nose of orange peel and toasted nuts. On the palate it has a very smooth creamy, vanilla character, and a long, lingering finish. Visually the colour is nothing out of the ordinary, a lemon yellow, golden colour. It is when you pour into the glass, the curiosity is peaked as the richness is hinted at in the rich viscosity of the liquid. Tangerine, pineapple, Satsuma, peach, honeyed apricot all leap from the glass through restrained by a youthful florality of freesia and orange blossom. The palate continues the story, so rich that words falter, the marmalade richness coats the entire mouth, it is almost like consuming a liquid dessert. They place a hand-made crystal spoon in with each bottle, as that is all you need to end any meal, just a hint or sip of this hedonistic wine. A cerebral drink to be savoured; it is delicious now but will appreciate with time and last for 100 years-plus. Just a spoonful of sugar helps the medicine go down” as Mary Poppins once said, and the legendary Essencia wines of Tokaji were long heralded for their medicinal qualities not to mention their high sugar content. Nowadays the healing capabilities of this magical wine may not be quite so readily accepted but Royal Takaji’s 2008 Essencia certainly puts a very broad smile on ones face. A deep golden hue with a plentiful supply of opulent viscosity. Emerging from the syrupy depths comes a rich honeyed nose encapsulating juicy apricots, sweet pear, white tea, wood sap and delicate orange blossom that holds true for as long as you care to keep it in the glass. The palate is the definition of unctuous, packed full of honeyed apricots and oozing with a deliciously languid, mouth-coating seduction. A fresh citrus drive provides all the necessary vitality to ensure this mind-blowing wine powers through on to an incredibly long, thickly coated finish adding beautiful floral notes and a touch of demerara as it goes. In reality it is difficult for a tasting note to do this wine justice and whilst it might cost a little more than ‘tuppence a bag’ there is no denying this is a truly ‘supercalifragilisticexpialidocious’ offering. Surely a 100 point wine. Drink from here to eternity. Of all the single vineyard sites, Szt. Tamás's is also one of the more voluptuous expressions. Deep gold in colour, the nose is concentrated and complex with notes of orange peel, honeycomb, ripe apricot and spice. The palate is intense, rich and unctuous with a good depth of flavour. Sweet, caramelised apricot and nectarines dominate, with a hint of citrus peel and white flowers providing vitality and freshness. Great balance and structure, very long, elegant and moreish! The Nyulászó (English translation “to catch hares”) Vineyard has always been a big part the house style of Royal Tokaji. It’s a 18 hectares vineyard just east of Mad, Hungary. It’s red volcanic top soil produces very elegant, lively wines. 2 ½ years barrel maturation in 300 litre second and third year Hungarian oak barrels. An elegant wine with great mid palate density. Apricot and honey burst out in the wine with beautiful acidity balancing the richness. Made from predominately Furmint grapes with the remaining made up of Harslevelu. This wine is beautiful now but will improve with further ageing. 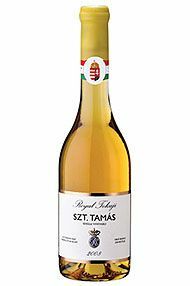 2013 Royal Tokaji 6 P Aszú Assortment, 6 btl (2xRTB,2xRTST,2xRTN).